Forever Kitchen Cabinets offers flexible plans through GreenSky® Loan Program to allow our customers an easier way to make payments and focus on the design of their new kitchen. Applying is quick and easy and can be done online or on the phone. Approval status is given in minutes after the application is received. STEP1: You apply online on the GreenSky® website, by phone, or on their mobile application. 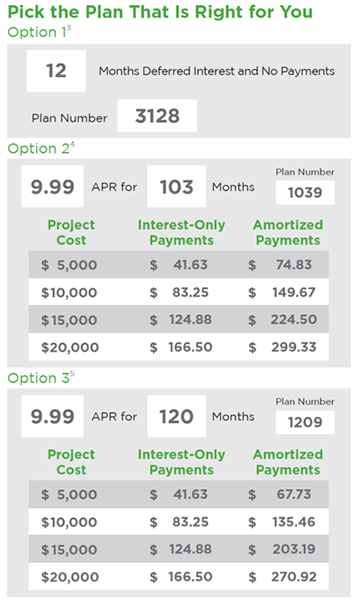 STEP 2: Credit decisions will be provided in seconds; approved customers receive a GreenSky® account number and loan agreement. STEP 3: GreenSky® will arrange payments with Forever Kitchen Cabinets. Interest accrues over the 12 months, but all interest is waived if paid in full before the end of the 12 month period. Fixed APR of 9.99% for 103 months. Based on each $1000 financed, 5 months of $8.33 payments followed by 98 amortized payments of $14.97. Fixed APR of 9.99% for 120 months. Based on each $1000 financed, 5 months of $8.33 payments followed by 115 amortized payments of $13.55. No interest, no payments for 18 months. Interest accrues over the 18 months, but all interest is waived if paid in full before the end of the 18 month period. 1 GreenSky® is a loan program name for certain consumer credit plans extended by participating lenders to borrowers for the purchase of goods and/or services from participating merchants/providers. Participating lenders are federally insured, federal and state chartered financial institutions providing credit without regard to age, race, color, religion, national origin, gender or familial status. GreenSky® is a registered trademark of GreenSky, LLC. GreenSky, LLC and its wholly owned subsidiaries service the loans on behalf of participating lenders. 3 Subject to qualifying credit approval. Interest is billed during the promotional period but all interest is waived if the purchase amount is paid in full within 12 months. 4 Subject to credit approval. Fixed APR of 9.99% for 103 months. 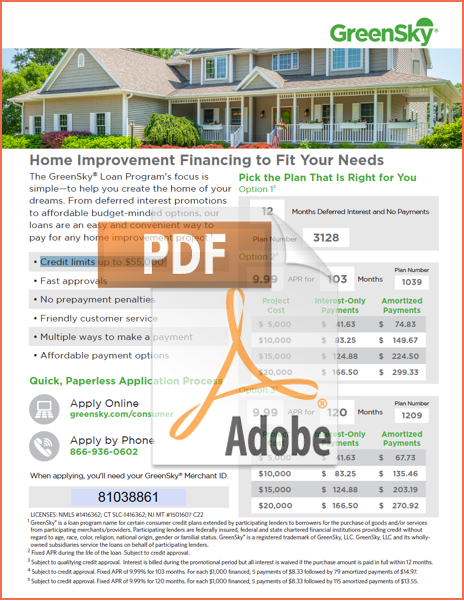 For each $1,000 financed,5 payments of $8.33 followed by 79 amortized payments of $14.97. 5 Subject to credit approval. Fixed APR of 9.99% for 120 months. For each $1,000 financed, 5 payments of $8.33 followed by 115 amortized payments of $13.55.